Flowers have played a part in countless weddings throughout the centuries, and a wedding wouldn’t really feel complete without them. In ancient Roman and Anglo-Saxon wedding ceremonies both the bride and the groom wore garlands, and in the Middle Ages children strewed flowers in the path of the bride as she emerged from the church – this is the origin of our tradition of the flower girl. In early rural weddings in this country the bridal wreath often consisted of ears of corn or wheat, signifying plenty and fertility, and in some traditions the bride still carries ears of grain in her bouquet. Flowers for your wedding can be as simple or as elaborate as you choose; there is no set rule to follow. 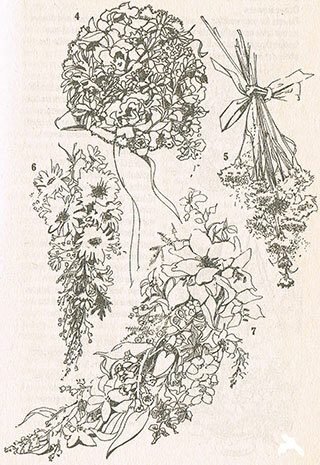 You may want to restrict them to a bouquet for yourself, particularly if you are going for a small, simple registry office wedding, or you may want to splash out on large bouquets for bride and bridesmaids, buttonholes for all the men, corsages for the bride’s and groom’s mother, elaborate arrangements for church and reception, and flowers around the cake. You will also need to decide who is going to do your flowers. 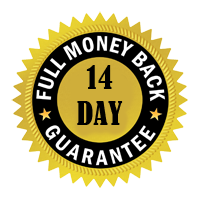 Ask several different florists for quotations and examples of their work so that you can compare the service. You may decide that you want to use artificial silk flower arrangements – ask around for a specialist who can make them up for you. Choose the colours of all the flowers carefully so that they all blend together tastefully. You may want to have all white blooms in your bouquet; if so, remember that white flowers can look very yellow against a blue/white dress. Colours for flowers could be pastel, such as pale blue, violet, pale yellow or pink; they could be rich and dark such as purple, crimson, scarlet or deep peach; they could be autumnal such as gold, orange and beige, or they could be bright such as blue and yellow, red, white and green, flame, purple and gold. Make sure that they complement the complexions, hair colours and dress fabrics of you and your bridesmaids. Some flowers are only available at certain times of the year; others may be available when not in season but at a vastly inflated price. Check with the florist when you are comparing prices. Plenty of the most popular flowers for bouquets, such as carnations, irises, roses, freesias and lilies are available all the year round. Some blooms, such as lilacs, lilies of the valley, cornflowers, heathers, lilies, carnations, daisies and gladioli are particularly long-lasting, and will not wilt at the crucial time! I Bouquets often have a little greeneiy to offset the colour of the flowers, but most arrangements are so ornate that they don’t need much. Popular choices are ivy, asparagus fern, lily of the valley leaves, myrtle and bracken. Bouquets come in many shapes and sizes, from the floor-to-shoulder draperies of lilies seen early this century to a single bloom carried by the bride. Most, though, are somewhere in the middle! When choosing the shape and size of your bouquet keep in mind your own height and build and colouring, the length and fabric of your dress, the ‘feel’ of the wedding – very formal, country garden, minimal ceremony, spring, winter, etc – and, last but not least, how much you want to spend. Flowers for your wedding are unlikely to stop at just your bouquet and flowers for the bridesmaids! You may want to continue the colour scheme of your flowers through to the buildings and the other guests so that they unite the whole day in your chosen colours. In many countries of the world small children attend marriage or betrothal ceremonies and scatter flowers, so traditionally flower girls (usually aged under 10) carry baskets of flowers. These had their origins in the tradition of the men at the wedding wearing ‘favours’ – usually knots of ribbon – in the bride’s chosen colours. In the 18th century the men wore flat white satin bows on their shoulders. 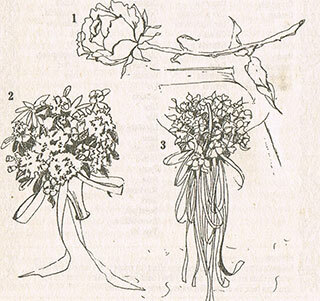 These days the buttonholes are more likely to be carnations, roses or lilies of the valley. They can be ordered for just the men of the wedding party (groom, best man, pageboys, fathers of bride and groom) or for all the men who will be attending the wedding. Many registry offices are decorated with fresh flowers in pretty arrangements each day, and so you may not need to provide them yourself. Check with the registrar when you make arrangements for your wedding. Some churches have restrictions on the colors or sizes of the flowers allowed inside; check this in good time. 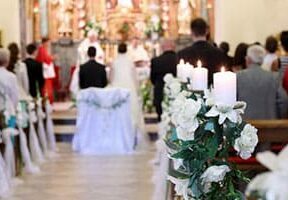 Sometimes you can choose the flowers in conjunction with the person who would normally have been arranging the church flowers for the following Sunday – if so you may not need to pay all the cost of the flowers yourselves. Pew ends are decorative flower arrangements in the shape of posies, rings, hearts or sprays: this is an American custom that is becoming popular in this country as well. Flower arrangements at the reception will continue the festival air and brighten up even the dullest hall. If the reception is formal you could order a small arrangement for each table and larger ones for the sides of the room. For a buffet the tables could Include a selection of small arrangements. 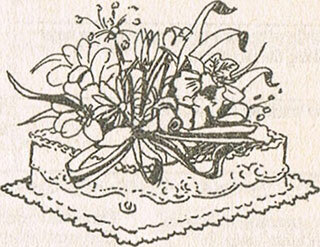 The cake may be topped or surrounded by fresh flowers. Some brides and grooms arrange surprise bouquets for presentation to their mothers just before they leave for their honeymoon. What shape do 1 want my bouquet? Do 1 need any fresh flowers for my hair or headdress? What ‘feel’ do i want to give with the flowers 1 choose? What color flowers do i want? How much do I have available to spend on flowers? Are there any favourite flowers 1 want included? How early do 1 have to order from the florist? If so, are they available at this time of year? Will the flowers be delivered, or do 1 have to collect them? Do 1 want to include any flowers because of their sentimental value? Will the flowers be ready the night before the wedding or on the day? Will these be done by the caterer, if we have one? What flower arrangements do we want – size, quantity, colours? Will these be done by the restaurant or hotel holding the reception? How much will they charge? Do we want any extra arrangements to decorate the tables or the cake? 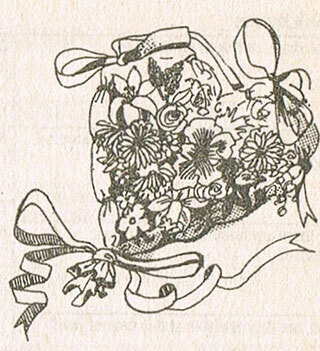 in Victorian times the ‘language of flowers’ was an elaborate code which lovers (or suitors) used to send detailed messages to each other. Here are the meanings of some of the flowers that you may wish to include in your bouquet. What kind of bouquets do I want for the bridesmaids? How many buttonholes do we need? Who will collect these, and when? Do 1 want them the same colour as my bouquet, or different? Who will hand them out, if the guests are to have buttonholes? Will they be the same shape and size for each bridesmaid? What colour buttonholes do we want? What flower do we want lor the buttonholes? What kind of arrangement does the flower girl need? Do we want to order flowers for the mothers of the bride and groom? Who will do these? At what stage are the church flowers put in place? Who will pay for them? Do we want any pew ends or extra flowers? For all your flowers, leave a contact phone number in case of emergencies, and phone several days before the wedding to check that all the details are correct. And, finally, some messages you might not want to put in your bouquet!